There is nothing quite like the shopping experience that is Black Friday. It is a gauntlet of commerce that kicks off the entire holiday shopping season, dominating the attentions of most brands and retailers. But holiday shopping has changed significantly. 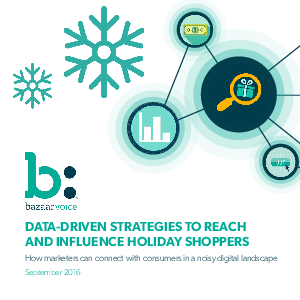 Shoppers are savvier, armed with a wealth of information and insight at their fingertips everywhere they shop. The result: for brands and retailers, the stakes are higher than ever. Our eBook offers key insights to inform your strategy.